When it comes to the NHL, it appears that back-up goalies are a dime a dozen. I honestly believe that to be true, after all, wouldn’t you rather see 10-20 NHL games at full salary instead of 50-65 AHL games making 1/10th of what you could in the NHL? However, the role of back-up goalie has changed a lot over the years and teams have utilized them differently too. Today, many back-up goalies are cheerleaders with pads. The reason is goalies like Jonathan Quick, Pekka Rinne, M-A Fleury and other starting goalies are logging nearly 70 games a season. With that being said, teams like the Blues are using their goalies more like a tandem with Elliott and Halak each appearing in less than 50 games. For goalies that don’t see much ice time, they still need to be good teammates and avoid being a distraction. That means still busting their butts in practice and being a leader or a voice on and off the ice. Some back-ups have had problems keeping egos in check and I am sure we can all think of a goalie or two who has found themselves shipped off because they couldn’t be a team player. 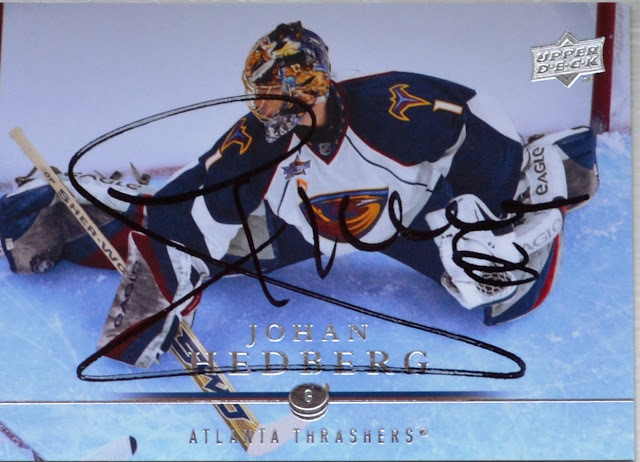 Johan Hedberg in my opinion is almost the IDEAL back-up goalie. For starters, he is the perfect team player. Don’t believe me, in Johan’s two years with New Jersey he has won the “Players’ Player Award” twice which is voted for by their teammates and this year also shared the Unsung Hero Award with Bryce Salvador. 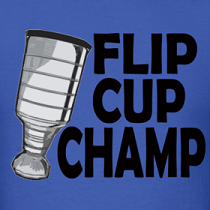 Former winners include Scott Stevens and Doug Gilmour. Even in his Atlanta days, Johan was winning a similar award in the 06/07 season. 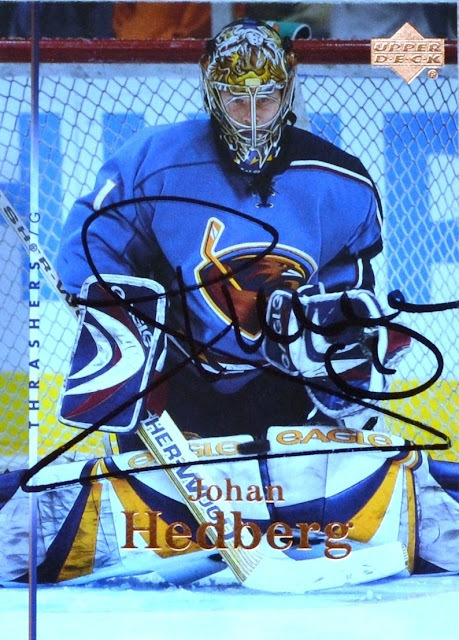 Another reason why Hedberg is an ideal back-up goaltender is his ability to win after not playing for a while. This season, Johan Hedberg is undefeated when he has at least 5 games between starts. 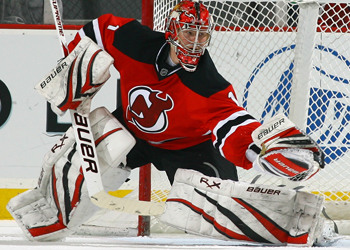 In fact, his record since the All-Star break is 5-0-1 with 2 shutouts. Now that is exactly what a team needs from their back-up goalie. His record for the season is a pretty solid 17-7-2 with a 2.23 G.A.A and 4 shutouts. Certainly Moose can take some credit for the Devils return to the post-season. 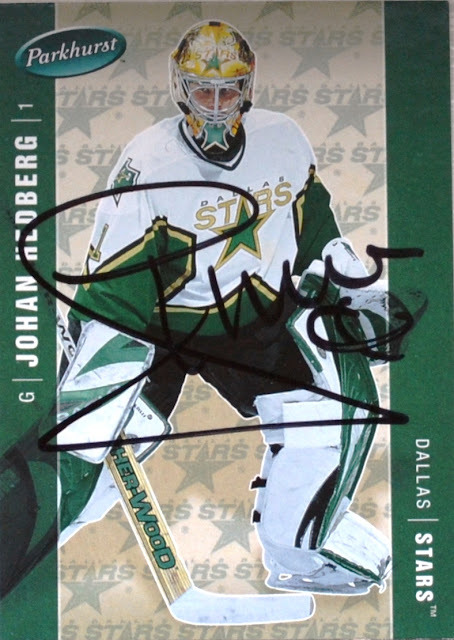 I don’t actually own his rookie card, but I do have an autograph already of Johan Hedberg. It came as part of a lot purchase I bought a while back off eBay. Of the three autos, I really like the first two Upper Deck ones the most. His auto complements the card really well. I am really happy to have these and it means more that he signed them for me rather than the one I bought off eBay! Got to see Hedberg play when he was with the Manitoba Moose. Was a huge fan fave back then. Hedberg is a solid back up. He is right up there with Martin Biron as one of the better veteran back ups. Love that first Upper Deck card. They always seem to have the best pictures of goalies. The Devils have some old goalies, with a combined aged of 77. What are they going to do when these guys retire? Jeff Frazee and Keith Kinkaid don't look like NHL goalies to me. Yeah that first one is my favourite too. As far as future Devils goalies go, I am not too impressed with Frazee either. Kinkaid I think could be a surprise like Brian Elliott but as far as serious prospects go, I think our hopes are in Scott Wedgewood and Maxime Clermont. Wedgewood is my pick for Marty's successor.